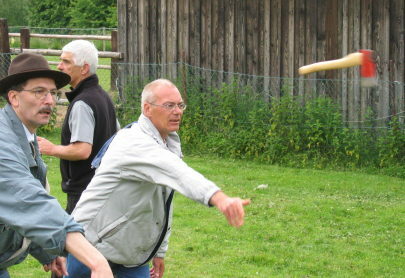 Midsummer Throwers Meeting 2004 in Pottenstein, Germany. 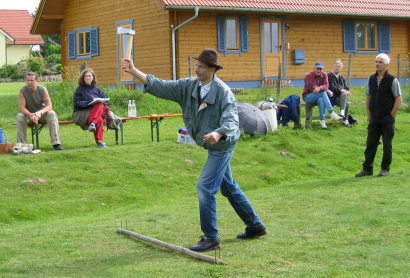 On Saturday the 19th of June, the traditional Midsummer Throwers Meeting took place at the house of Norbert Maier (who runs Axtwerfen.de) in Pottenstein, Germany. You might want to read about the last years' meetings. 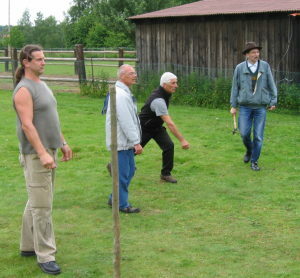 Five throwers gathered to compete after some refreshments and expert talks. 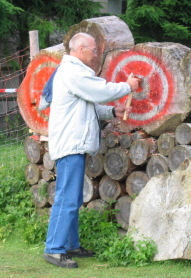 As distances for the throws, we used the AKTA (American Knife Throwing Association) standards this year: 12 feet (short distance, 3.65m) and 18 feet (middle distance, 5.5m) for the knives, 14 feet (4.3m) for the axes. To be more fair in awarding points, each knife would be made upright, then the higher ring still touched by the middle of the blade would count. There were ten rounds per event, the participants threw one tool at each of the three targets per round, totalling in 30 throws per event. 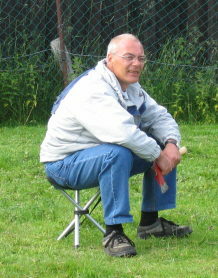 After the competitions, during which we luckily had nearly no bothering rain, it was time again for free throwing. 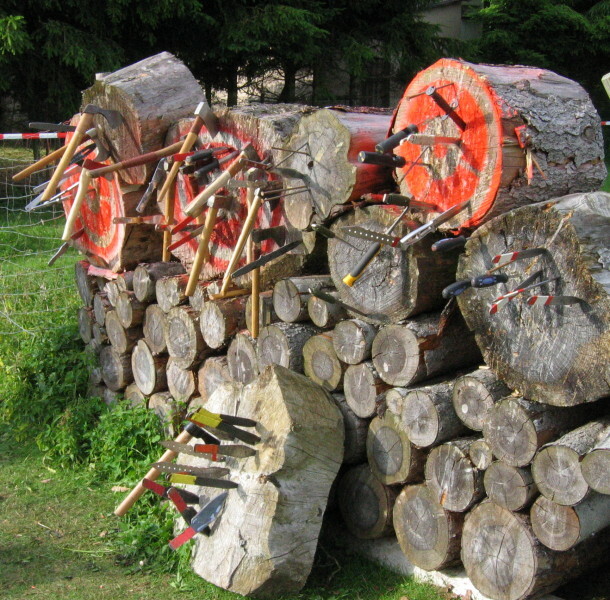 To please the journalist in attendance, we stuck all our throwing implements into the targets, having much fun announcing the exact place where our next axe would stick. 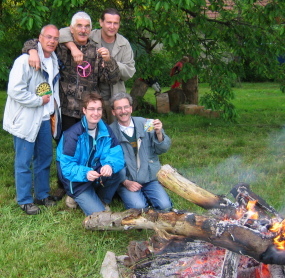 The barbecue gave us opportunity to recover, before the (five) winners were announced in the award ceremony. Soon after, everybody had to return home. Thank you very much, Norbert, Brigitte and Anja for your hospitality and the food! Full concentration in the warm-up phase. There a even some spectators present, and Anja keeps track of the scores. It's not always easy to judge the points. Everybody needs a break once in a while. 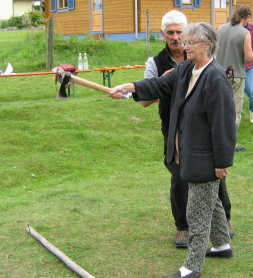 A spectator learns how to throw the axe. 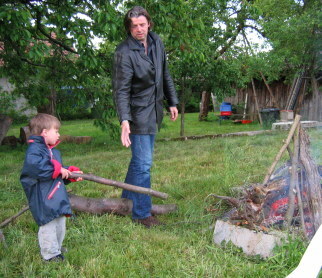 The neighbour's boys help to get the fire going. After the meal the award ceremony. For the press, we stuck all our throwing implements into the targets.